Have you ever play Paper Mario video game? Few years ago, I borrowed Paper Mario from a friend and it was for Nintendo 64 system. I had a lot of fun playing with it. I did successfully complete the mission. My wife and my children helped each other too. We also looked up some hints from online. 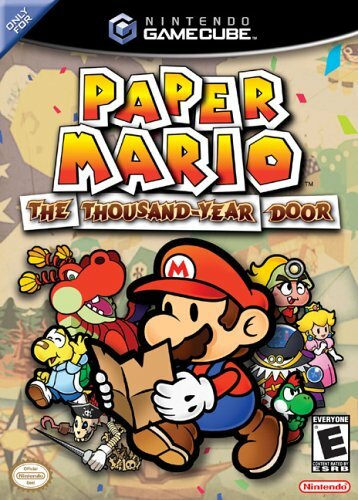 Two Christmas ago, we got Paper Mario: The Thousand-Year Door for family – this time it is for Nintendo GameCube. For some reason, we did not play it much and forgot about it. Recently, I finally step up and start playing again now. I get tired of looking up online for hints. I purchased Official Paper Mario: The Thousand-Year Door Player’s Guide from Amzaon.com and it was worth paid for — plenty of pictures, easy to look it up whenever I need it. Right now, I am in Chapter 2 – I know I’ve got long way to go but I am looking forward to it. If you want to look up free hints online: Click here. Ever since Hurricane Katrina hit Gulf coast hardest last year, it impacted so many things – you hear about it all the times on TV, news online and other things. According to Anderson Cooper 360 Blog, Did Katrina evacuees bring more crime to Houston? Even they are being careful what they said (political reason) on the article but you will see plenty of people’s comments that it do cause criminal up since Katrina evacuee came into picture. I really don’t think it is one side thing – it takes both side to cause all kind of problems. City of Gretna (Near New Orleans) did smart thing by block the bridge to keep Katrina evacuees coming in. Sure, they got heated up for doing it but did they do right thing? You can read more stories about it here. It is very much unfortunately. I can feel their pains because I definitely wouldn’t want to see criminal goes up in my area (Dallas) too. Even it’s not that far from New Orleans or Houston. It’s only five hours drive. They believe that it does affect many another cities such as Dallas, Austin, etc but I didn’t see a lot of headline about it lately. Personally, I met a gentleman who happens to be my interpreter one time while ago. He is one of those Katrina evacuees and he told me about it. He lost his house and everything. He had to start over like getting new car, new clothes, computer etc.